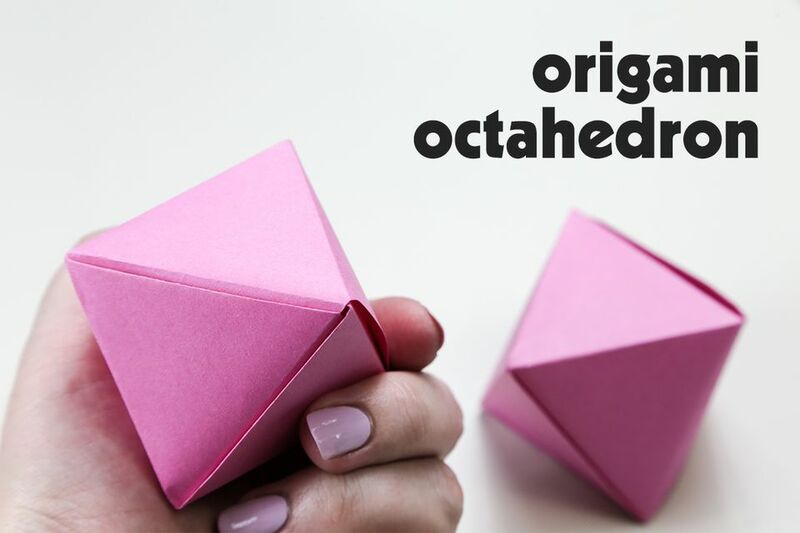 Learn how to make a little three-dimensional origami octahedron! Hang these up as decorations or use them as a gift box! This little origami gems would look awesome on your Christmas tree! You will need one sheet of A4 or letter paper that has been cut in half diagonally. This would work with any size rectangular paper such as A3, A5 or printer paper! This origami tutorial is intermediate level, if you're a complete beginner, maybe start with the origami blow up star instructions first. 2. Fold the paper in half bottom to top. 4. Fold the bottom right corner and align with the center crease. 5. Unfold. You should have this crease. 6. Fold the top right corner and align with the center crease. 7. You should now have these 2 creases. 8. Fold the paper in half bottom to top. 9. Fold the right diagonal crease to the left. 10. Flip the paper over, top to bottom. 11. Fold the bottom right corner up to the left and align with the top edge. 12. Flip the paper over again and repeat the process. 13. Each time the triangle aligns with the top edge. 14. Repeat until you get to this. 15. Flip it over to the back and fold the little edge in as well. 17. Make sure the paper is on the side where the horizontal crease in the center is a mountain fold. 18. Fold the paper almost in half, aligning the creases. 19. Unfold and flip over. The crease you just made should be a mountain fold. 20. Fold the paper back in half, at the same time fold the mountain creases inside, the top crease should point to the left and the bottom crease should point to the right. 21. Fold the left vertical crease backward. 22. This is what you should have. 23. Fold the top left section over the bottom section and unfold. 24. Make the end of the top left section a valley fold. 25. Open the lower section to create the octahedron. 26. Tuck the top left flap into the right section keeping the top right section together. 27. Tuck the top right section into the gap. Now you should have a three-dimensional octahedron.